Luther’s concern about appreciation for the message of Mary’s song, the Magnificat, was expressed in the words: “The oftener we sing it the more we silence its true music and meaning.” Throughout his great commentary, he invites the reader into living participation in Mary’s song. “It needs to be pondered in the heart, what it means to be the Mother of God. Was not hers a wondrous soul? We should ‘bless’ Mary, in keeping with her prophecy, all generations shall bless me. Such a blessing is done with all one’s strength and with downright sincerity.” Above all the Magnificat is to be experienced and felt. Luther preserved a warm piety towards the Virgin Mary, accepting the traditional doctrines, from ‘Mother of God,’ to her virginity and sinlessness. Always he related Mary to Christ and his work of salvation. She is seen as a marvellous example of the divine power of redemption. Her own act of faith at the annunciation shows that she was totally justified and sanctified by God. Yet, in her song of praise she referred all glory and power to God, claiming only lowliness for herself. By this she sets the example of a truly Christian life. In his ‘Order of Public Worship’ (1523) he kept the Assumption as August 15th saying: “We believe that the Mother of Christ is with him in heaven (since all saints live in God). Yet we cannot know ‘how’ she is in heaven, and it is in any case not necessary to know it.” What ought to be celebrated is not the assumption of Mary but the ascension of Christ, by virtue of which Mary is also in heaven with her Son. in his Christmas sermon, Luther devoted part of it to the Virgin who gave birth on that day. There are two ways of faith in this matter; the first faith believes the fact that the Virgin called Mary gave birth to a baby named Jesus, even believing she was an immaculate virgin and Christ was more than a man. But if these words are planted no higher than in my thoughts, then they have no firm root. The second faith is the important one; it proceeds from the heart. Mary gave birth to her child for me. 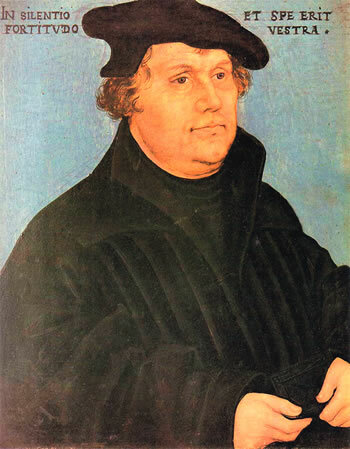 Luther’s constant concern was that faith be not only conceptually or doctrinally true, but also alive and fruitful, that it commits the whole believer to Christ as Christ commits himself to the believer. Luther’s entire theological effort was to make sure that being brought into right relationship with God (justification by faith) meant that there should be no speculation on Marian privileges and no stress on Mary’s cooperation with her Son in the task of salvation. The Virgin is entirely a receiver of God’s grace. Her lowliness is her greatness; she has no greatness of her own but only that of Christ. It follows that prayer to Mary or to any saint is not a normal Christian way. It should not try to force the hand of God. It is better to remain indirect: asking God through or with the intercession of Mary rather than asking Mary to intercede for us. No one is saved except through the only mediator, Christ (1 Tim 2:5), but this does not rule out that we may pray for one another and the saints and notably the Mother of God can pray for us. What Luther sees is two types of mediation, a mediation of redemption or salvation pertaining to Jesus that Scripture clearly ascribes to his sacrificial death, and a mediation of intercession by which we may pray for one another and invoke others (saints and Mary) for assistance along our journey. n of the Magnificat has become a thing of the past.